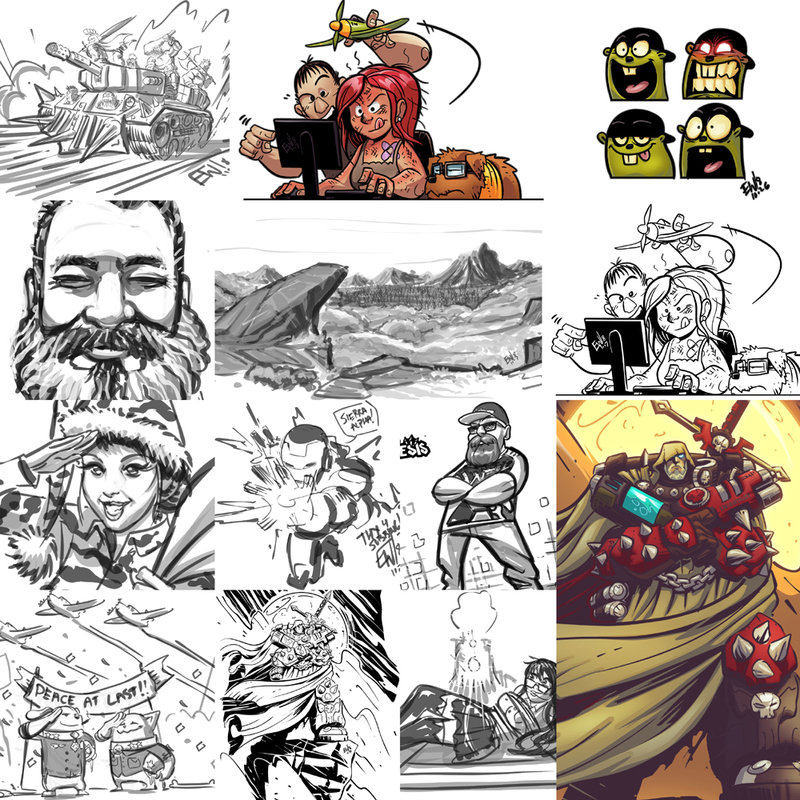 Stream Notes: Subscribers 2018 Collage Drawing -- Novembers a wrap!! Thank you for a great day of marathon drawing madness. We even got some giveaways and some thank you sketches for re-subs and new subs in along side this colossal piece! This is every single sub that is currently subbed to my channel right now. We got every single one in there. All 59. Including me, Kiwi and Wally as the last touch on the giant DRS ship at top back. Thank you to everyone for their support, and for coming out and checking out this drawing. When this piece is complete, it'll be offered for purchase as a hi quality print and also digitial download in the ewSHOP! The plan is to provide a hires print of the original sketch drawing ( shown above ), the finished inks and the finished colored piece. Those interested can order a copy of the finished print or purchase the hires digital files and print their own. The premier stream of ewDRAW was a success, and I plan to do more of them in the future. As for this piece, look for another ewDRAW stream to be announced for an evening or two next week to start inking and eventually coloring this piece!! I feel like Drawing Request Show finally is hitting its stride and it seemed like a great time to introduce a new show/ stream-type to the channel. I announced today I have plans and ideas for other show types as well. Two being Draw-Fu - an educational drawing school type stream, and the other being ewGAMES ( working title ) where I play fast paced and exciting action and skill games that are for the most part largely underrated. Thank you everyone for your subs, your support and enjoying the channel this year. This also marks the last 'sub day' of the year. Onward to December, and the new year!! I'll be working hard on some new goodies for December and to carry us through the winter season after the new year. Stay tuned!!! See you when Drawing Request Show returns Monday, and stay tuned for announcement of the next ewDRAW!! EWG presents: ewDRAWS! on Twitch! 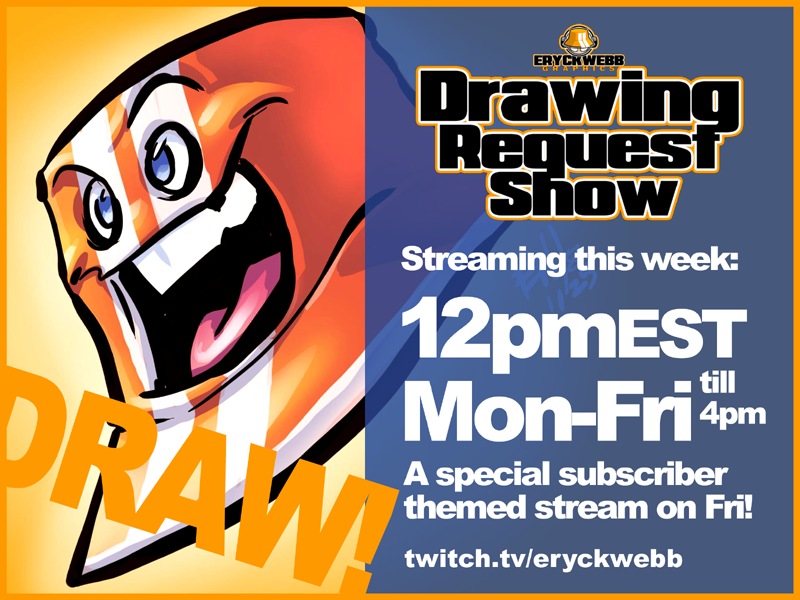 Eryck Webb Graphics is proud to announce a new show premiering on the Eryck Webb Twitch channel: ewDRAW! We'll be launching this show on Twitch 12pmEST over at twitch.tv/eryckwebb friday 11/30/18 as part of a special subscriber themed day! 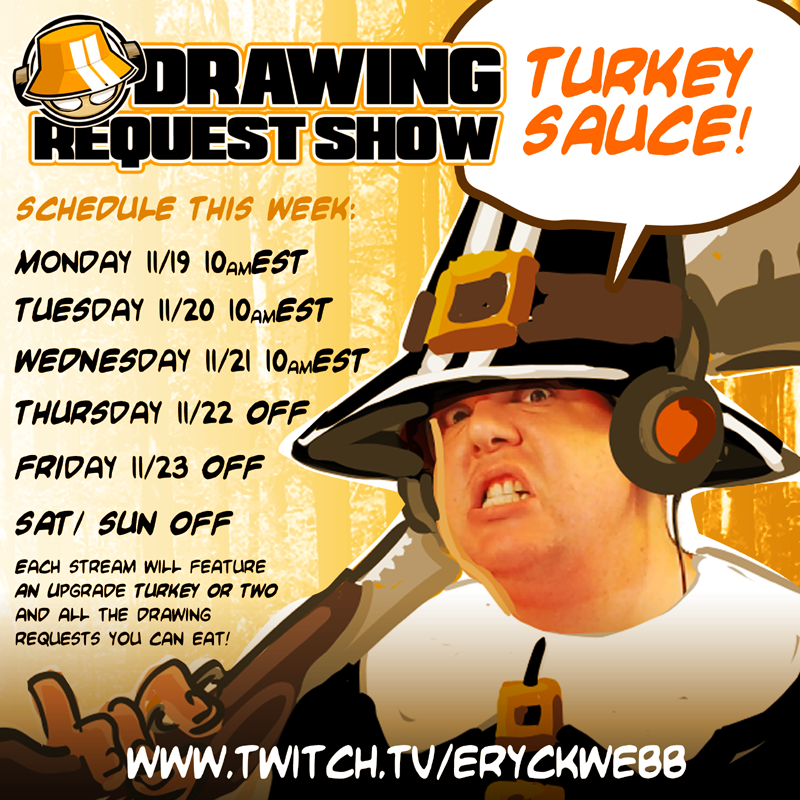 The Eryck Webb Twitch channel is known for Drawing Request Show, the flagship of the channel. Eryck has long wanted a separation between different activities and content on this channel but without sacrificing the overall brand and functionality. Now seemed like the perfect time to make an official addition to the channel. Everything about subscribing to this channel as a whole, donating to the channel and even giveaways being unlocked when we hit support goals will continue exactly the same way. Whats different, is the name, and the content. We're hoping this will create a distinct different direction for the stream depending on which show is streaming, but also remain all inclusive under the umbrella channel. 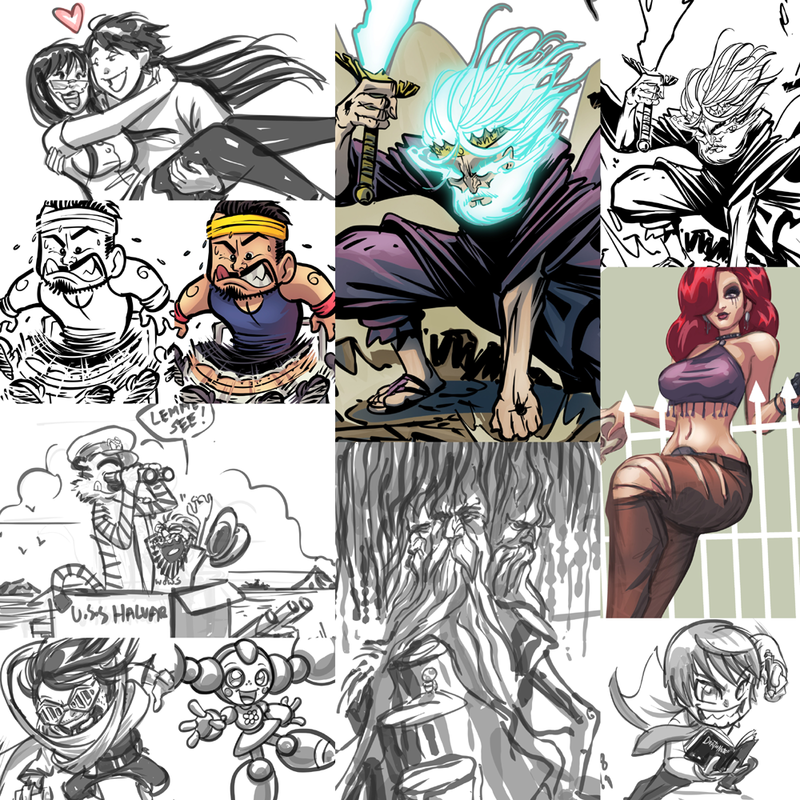 Drawing Request Show is a well oiled commission machine catering to people looking for personalized artwork or art for hire. ewDRAW! will focus more on Eryck's personal artwork, or community based projects not centered around requests or commissions. These projects will be bigger, more ambitious, and more geared towards Erycks creative exploration and inspirations. It's a new entity, and will develop over time, but kicking off the new addition to the channel on the last 'Sub Day' ( held last day of every month except New Years Eve) of the year seemed like the way to go. Over time this new show will develop its own unique sub perks for the crEW, and a definitive schedule, and perhaps even its own emotes and merch items. For now, we hope you will join us 12pmEST Friday 11/30/18 for the premier of this show on the Eryck Webb Twitch channel, and be sure to checkout the subscriber collage illustration we're kicking off the show with. For now, ewDRAW! will be only by announcement - usually on evenings or weekends - but the hope is to eventually lock down a more consistent schedule and make this addition a regular occurrence as we head into 2019! See you at the stream! 12pmEST only on Twitch! 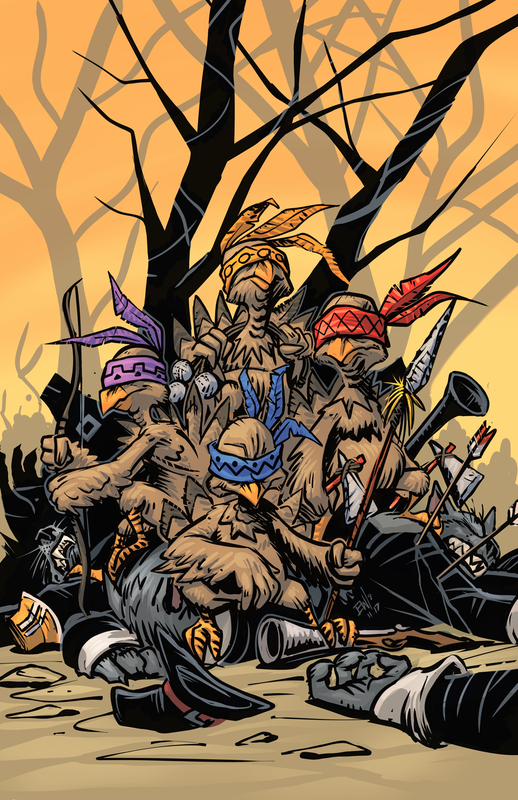 Inhouse Art: TMNTurkeys 2018 - Happy Thanksgiving from EWG! Eryck Webb Graphics presents this year's Thanksgiving Marauding Native Turkeys. Everyone here at the EWG mill, would like to wish everyone a wonderful day of giving thanks, celebrating another year beginning to wrap up and appreciation to all our individual blessings we're fortunate enough to have. We're thankful for doing what we love for a living, and all those who make it possible. From the support of family, the encouragement of friends, to the generous support of clients and fans, to the folks who follow Eryck Webb's websites and watch his Twitch streams every day. Thank you everyone! Have a wonderful Thanksgiving day and enjoy those turkeys! If you can defeat one... GOBBLE GOBBLE!!! Brainstorming and sketching around on some native turkey action this evening - going from more realistic to more stylized and in between..... its that time again... guard your turkeys! They're coming! Thanks for a fun week of creating! As of this post, all art sent, and master list updated!! We tried to match the last week where we finished fifteen upgrade orders around plenty of drawing requests over the course of the week. This week we came a bit short. We only got 11 done this week, but thats still pretty good. I'm happy with that. This week has still been packed with awesome requests, far too much sauce and some epic finished upgraded commission level art. 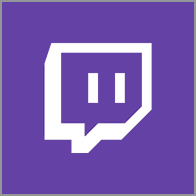 This week we streamed 12pm Noon to 6pm EST every day except Friday when I jumped into it early at 10am till 4pm. This was nice cause it gives me the mornings to tackle yard work and car maintenance and walk the dog and things that I used to do in the late afternoon when it was still daylight after 4pm. So this may continue. I'm noticing people want to cram their upgrades in on drawing days and their drawings in on upgrade days. So look for an adjustment to the schedule next week! I might opt for some shorter Drawing Request-only streaming and go back to separate upgrade production streams or just work on them off stream. Next week I'll be streaming Monday through Wednesday and taking Thursday through Sunday off for a long Thanksgiving weekend. While I won't be streaming, I will most likely be working on new stuff for the stream. This month is flying by! I never got to implement a bunch of things I wanted to put into action for this month! Its crazy. So I'm already putting my sites on December on. The books materials are all set just waiting on the books themselves and I'll start signing/ sketching and sending them out! I'm going to knock them all out and get them out within the same week that I get them! Have no fear! Also, after a few weeks off, work will begin immediately after the holidays on Volume 3 for a spring release! Alright, thanks so much everyone who cheers, donates, subs, hosts, spreads the word and enjoys the stream on a daily basis. Could NOT do this without you! Thanks you for keep me drawing. The CREW is full of amazing TREW believers!! Look for next week's official schedule to post Sunday evening! A blast from my childhood saturday morning cartoon past - i was requested to draw any character from the mighty ducks animated series from the 90s any way i wanted - so i did a cool pic of this character! Love combining my style and aesthetic preferences when drawing with disney and other animated character designs! Just drew this @TheRealStanLee tribute for warmup this morning! RIP stan lee! Excelsior!!! ... the man is forever an influence on my art and life ... and on the world!! NUFF SAID! Thank you everyone for a great week of streaming and creating. I'm going to keep this short cause I have to head out to visit family this weekend, but I got a couple highlights and notes to mention! 1. We hit our goal on upgrades this week! All November I will be putting an emphasis on finishing supporter's ink and color upgrades on their drawings. Drawing Request sketches come first, but we still have managed to get a lot done. Right now M-F my goal is to get 3 upgrades done a day with drawing requests mixed around it all. We got 3 done each day this week, in fact we got an extra one done on Wednesday!! So I'm very happy about that. Thanks for all the drawing requests, the upgrades, the priorities, the kind words, the hype and the encouragement this week! All art sent, check your whispers! See you Monday! BOR Vol 2 PreOrder Has Ended! -- Thank you! The Best Of Request Volume Two preorder is now over! Thank you to everyone for their encouraging words and their excitement over the new book. Thank you to everyone who bought one! Now its time to go place the order for everyone's copies. Will receive the finished books by the first week of December at the latest, then will go on a sketching, signing and packaging spree and get them out within a week from then. Thank you so much everyone and though Volume One and Volume Two are sold out, please look forward to Volume 3 early 2019! And catch more of the request action weekdays on Twitch! Thank you for everyones support, from the bottom of my hat... i mean heart! EW is live on Twitch for another day of streaming, creating, and rocking the draws! Going live at 10am Eastern Time! 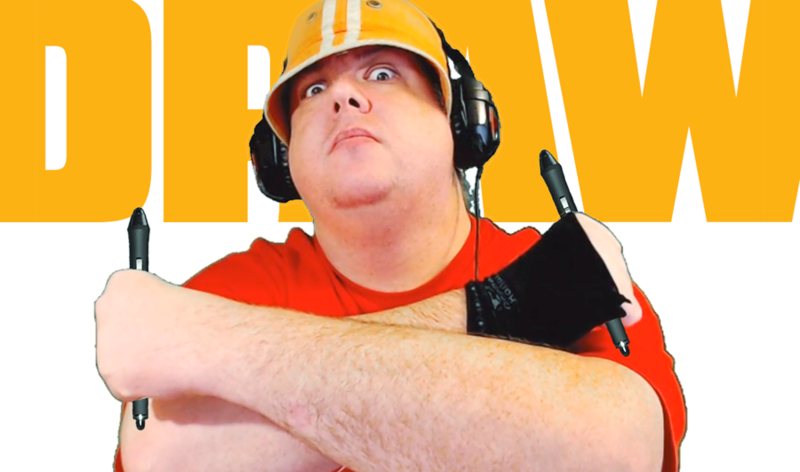 Alternating upgrades and drawing requests all day - creative akimbo! We are officially over the hump this week! Couldn't have done it without the crew! Thank you for a super fun stream day! We did an 8 hour and 30 minute stream (give or take a minute or two) and got a heck of a lot done. So far I'm staying on point getting 3 upgrade pieces done a day and drawing requests around it. Drawing Request Show is running smoother than ever with the new Upgrade / Drawing Request volley every hour. I even got to experiment with a more painterly concept art style on a landscape request for hairfoot. I pulled out my best Bob Ross imitation for that one. Thank you to everyone for the encouraging words, the bits, the donations and for watching and enjoying the stream! Best of all? Back tomorrow 10amET with more! Till then... SKETTIE TIME!!! Get all the art sent out tonight and see you all back at twitch.tv/eryckwebb - same drawing time, same drawing channel!!! EW is LIVE with all the creative sauce! We're doing a six hour stream today alternating an hour of drawing requests, with an hour of upgrade action, and repeat! Grab a seat!! 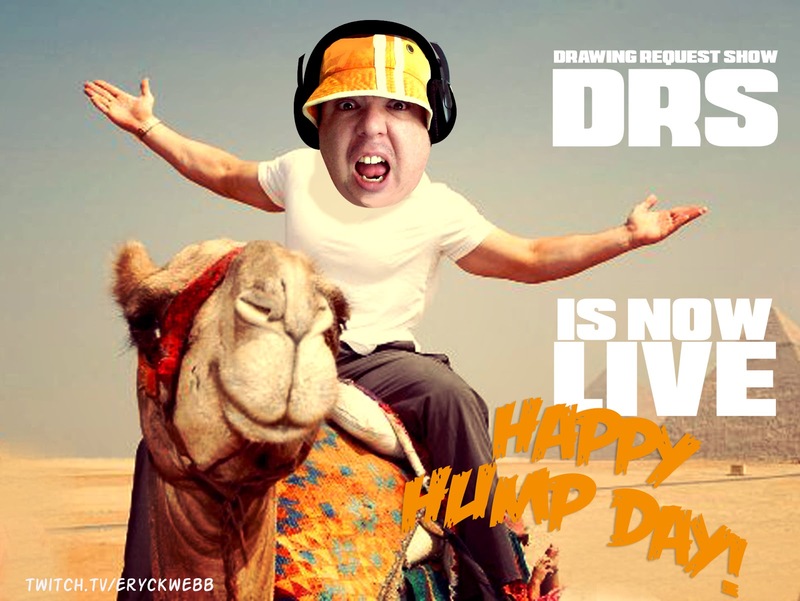 Its time to draw our way over the hump!!! Also I feel I must remind everyone, the Best Of Request Volume Two preorder ends after the end of Friday's stream! Then we're placing the bulk printing order! If you want in on it - grab one before then!! !